Here is a special message from some friends in Connecticut. 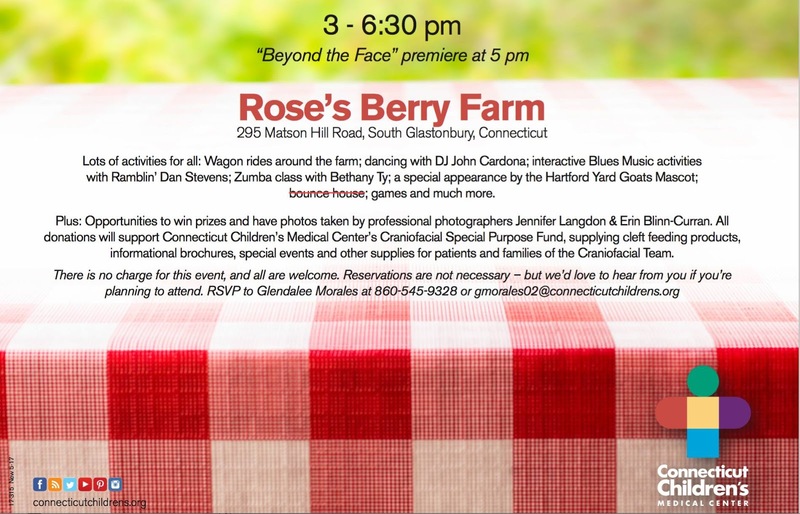 They are holding a fundraiser and awareness event at Rose's Berry Farm in Glastonbury, CT.
July is National Cleft and Craniofacial Awareness Month and we are celebrating by hosting a picnic at Rose’s Berry Farm in South Glastonbury on 7/22/17. The main event will be the premiere of our very own documentary, “Beyond the Face”. Everyone is welcome, admission and picnic food is FREE. I have attached a flyer which provides more details(bounce house has been removed from the event but more activities will replace it). I will send a printed invitation and flyer to you if I have your address. Please send me an email if you’d like extra flyers. Raffle tickets and some activities will provide opportunities for anyone to donate towards the Craniofacial Special Purpose Fund. If you would like to contribute by providing a raffle prize please let me know, it would be greatly appreciated.